In the fall of 2009 I was on a photographic trip to California with close friends. Our first stop was Point Lobos. This is a beautiful area of craggy Monterey Pines and rugged coastline. I discovered this 10-15 foot tall rock face late in the day, at the end of a nice, long walk around Weston Beach. The complementary colors and design in the rock caught my eye. I was primarily a landscape photographer at the time. However, the design was so compelling that I chose to treat the image as abstract art. I came in close, using the relatively narrow view of a telephoto lens to reduce the scene to bare essentials of line, form, color, and pattern. A large and incoming autumn storm was sending huge waves crashing against the shore. They were striking the backside of this stone with great force. Massive vibrations rippled through the ground. Every few minutes a particularly large and powerful wave would send a stream of seawater up and over the slab next to me. Small pools of seawater would form only a few feet from where I stood, and then disappear into the sand. I worked as quickly as I could to get the shot before storm surges could douse and potentially ruin my camera gear. 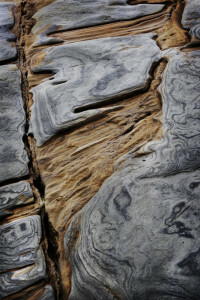 The colors and design are expressions of the rock’s geological history. It amazes me to think that the blue and orange tones belong to different layers of what was once oceanic sand—sand that was compressed by other sand that over time formed on top of it, and that over millions of years it was slowly conveyed by the Pacific plate all the way to the California coast. There it ran into the North American plate. Unimaginable earth forces heated the sand in the rock, turning all of it to fused crystal. Pushed up to a standing position, it was exposed over millennia to rain and sun. Those two were the artisans who carved the design. My chance encounter with the stone was a treat. I was offered a window into the past, and presented with visual beauty in the present. Nice.